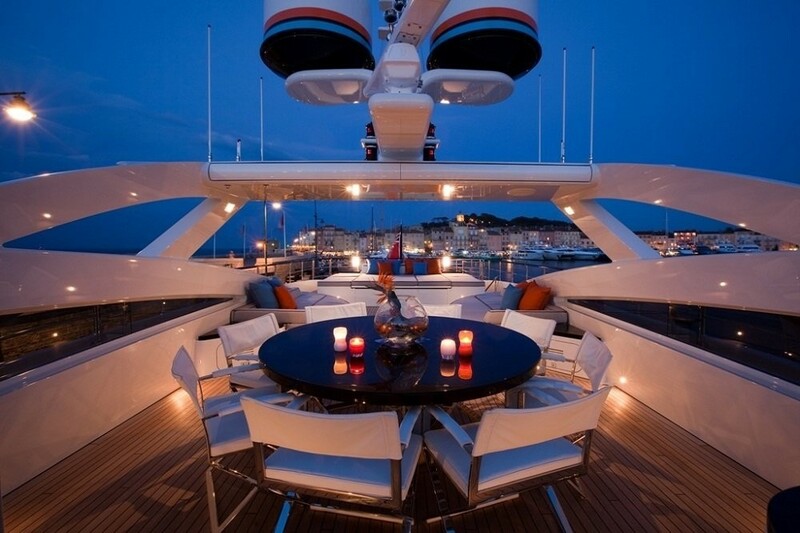 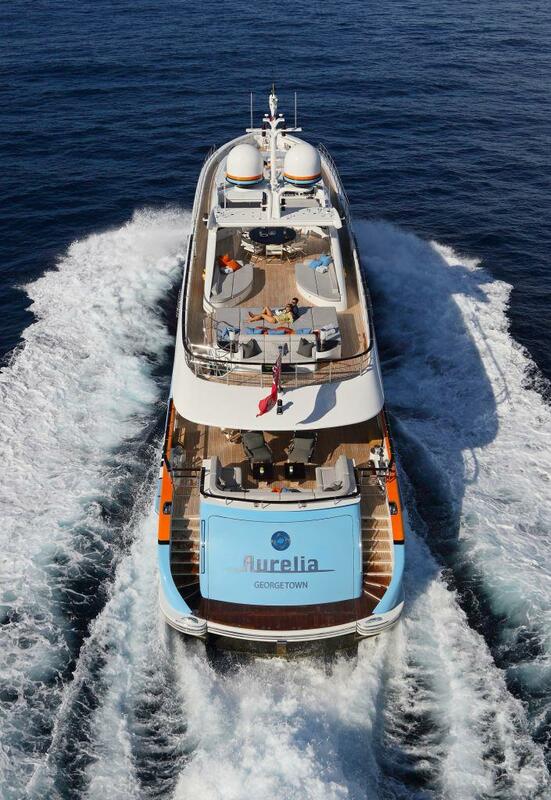 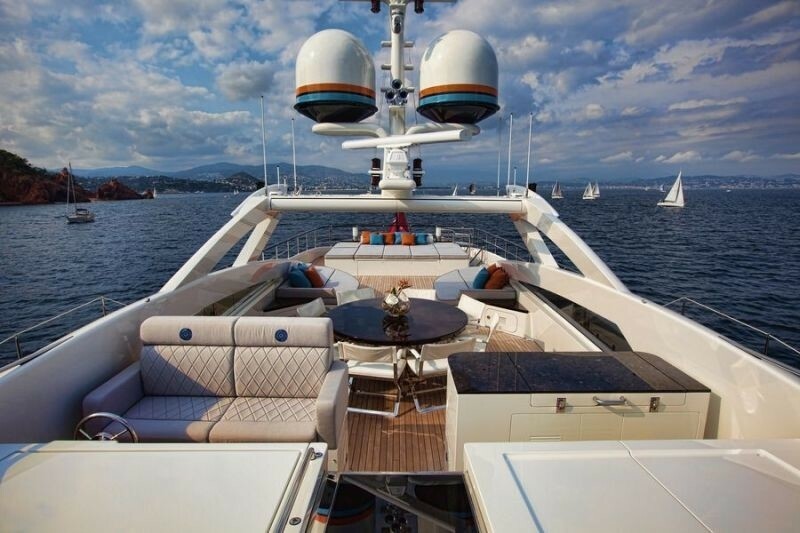 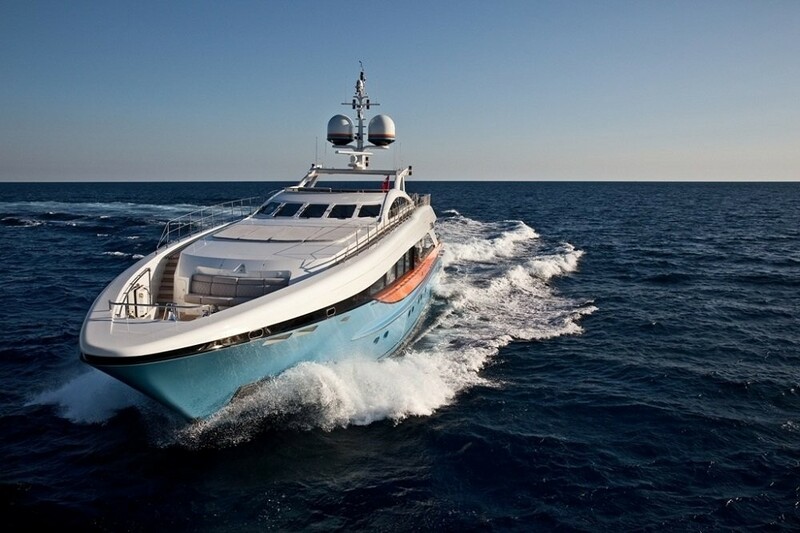 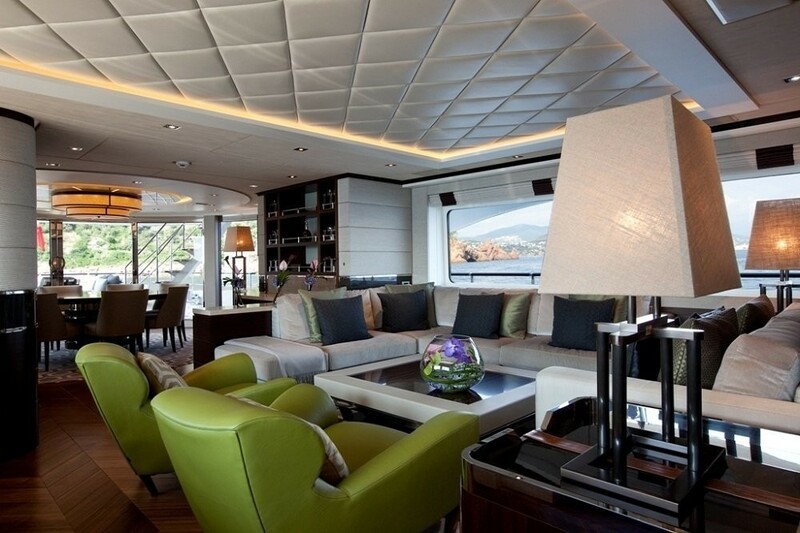 Luxury charter yacht AURELIA is a 37 m vessel built by the Dutch shipyard Heesen Yacht under the hull number YN 15437. 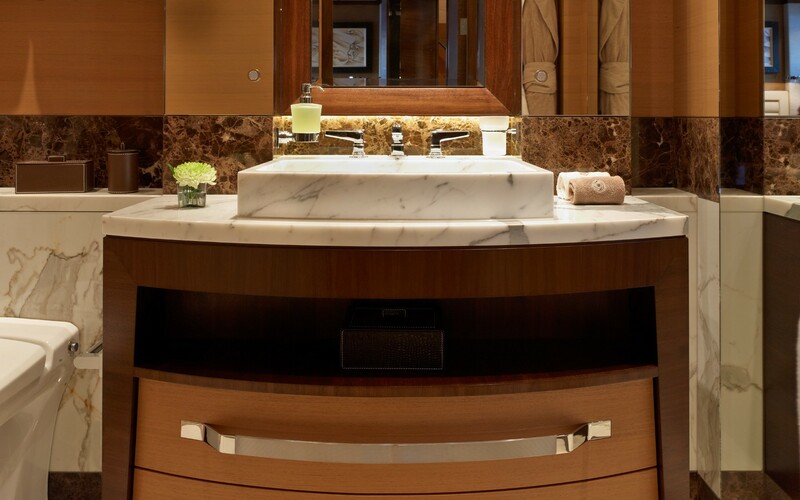 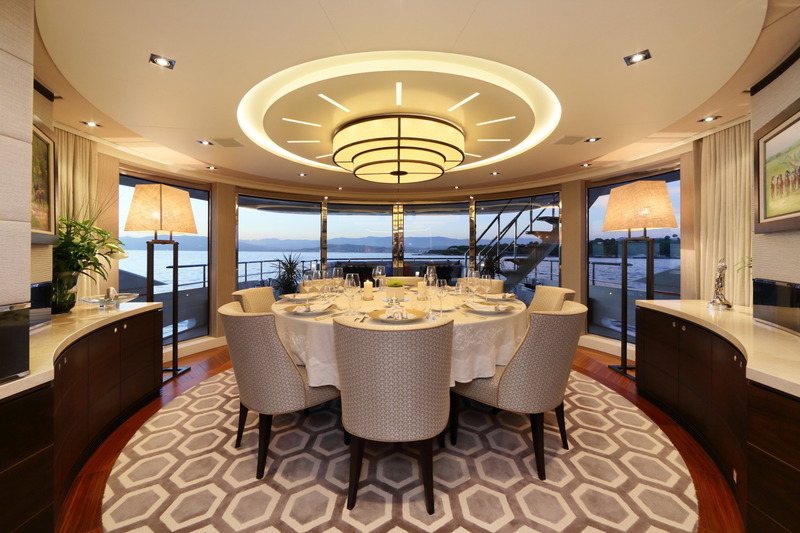 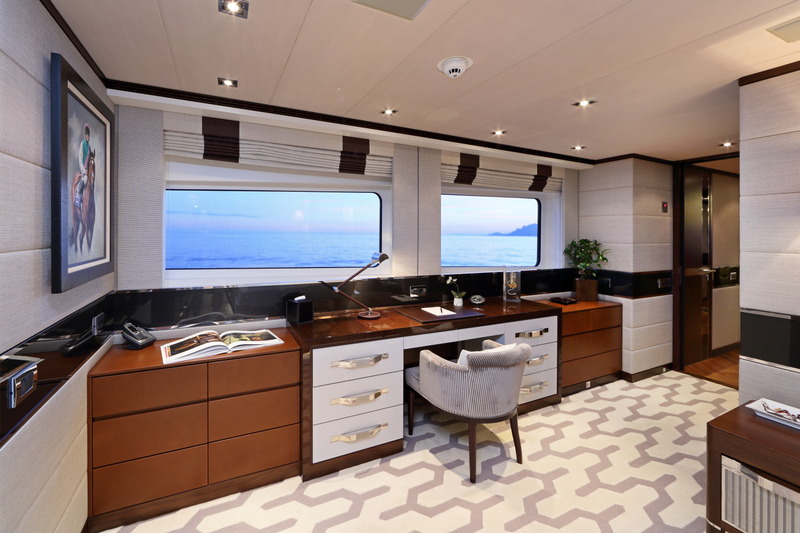 The semi-displacement superyacht Aurelia is the tenth yacht from the very successful 37m Heesen series, styled by Frank Laupman of Omega Architects and features interior design by Bannenberg & Rowell. 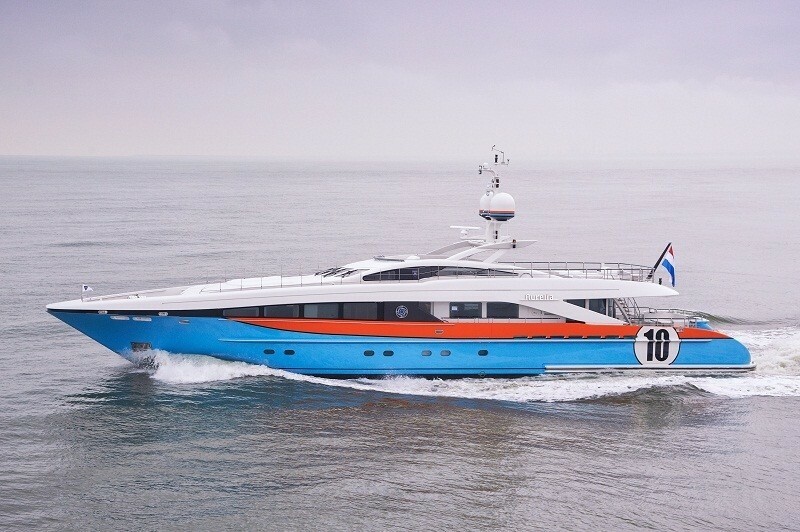 She was launched in June 2011. 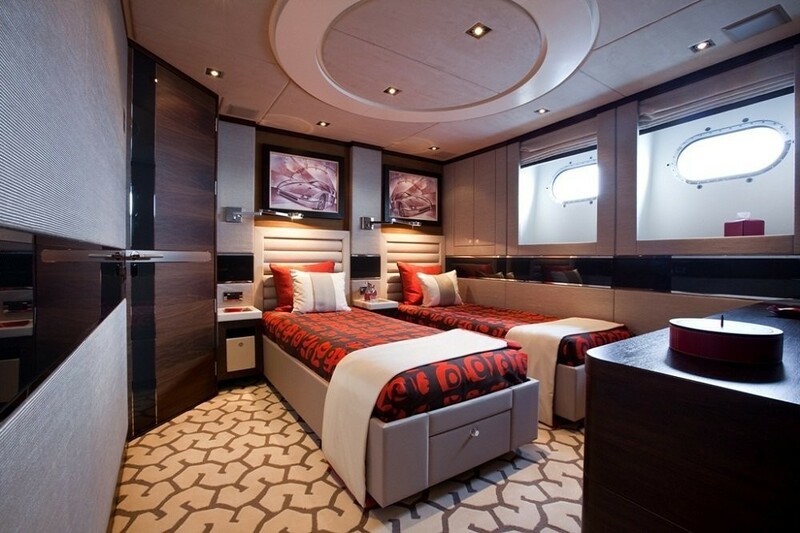 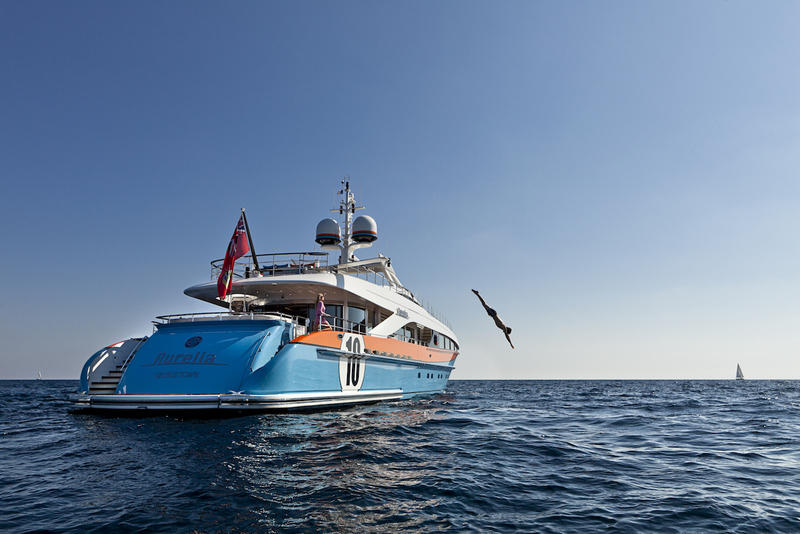 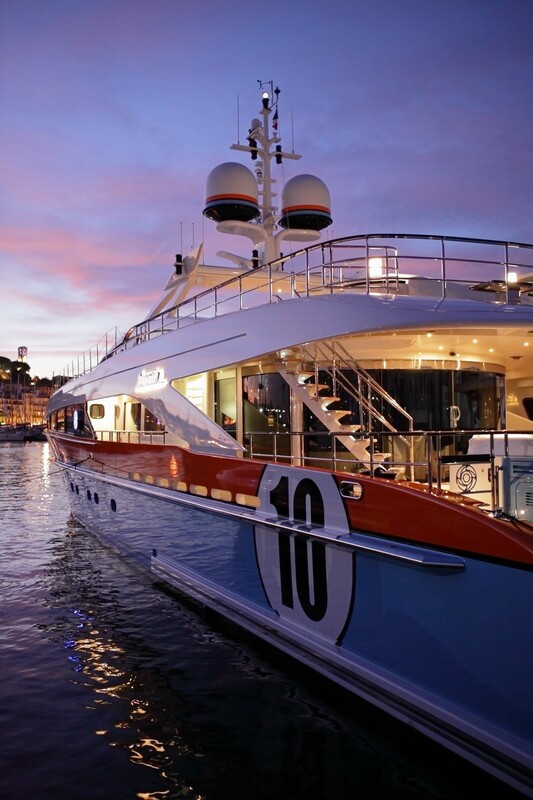 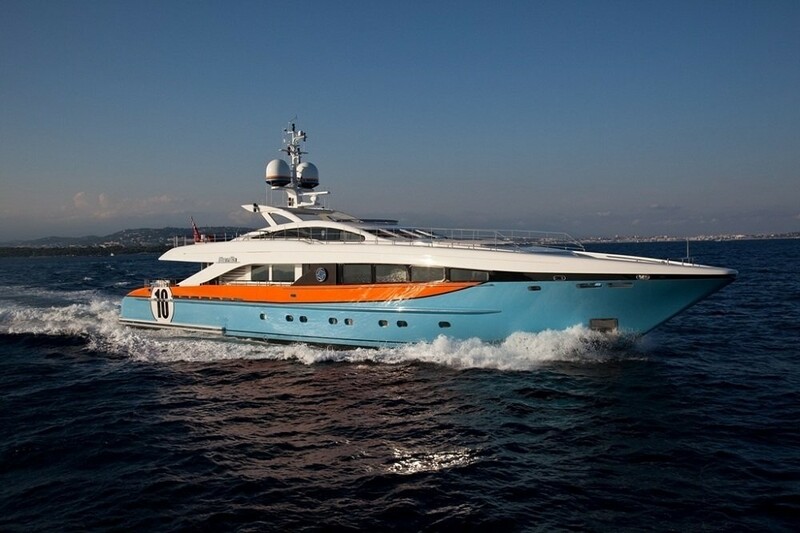 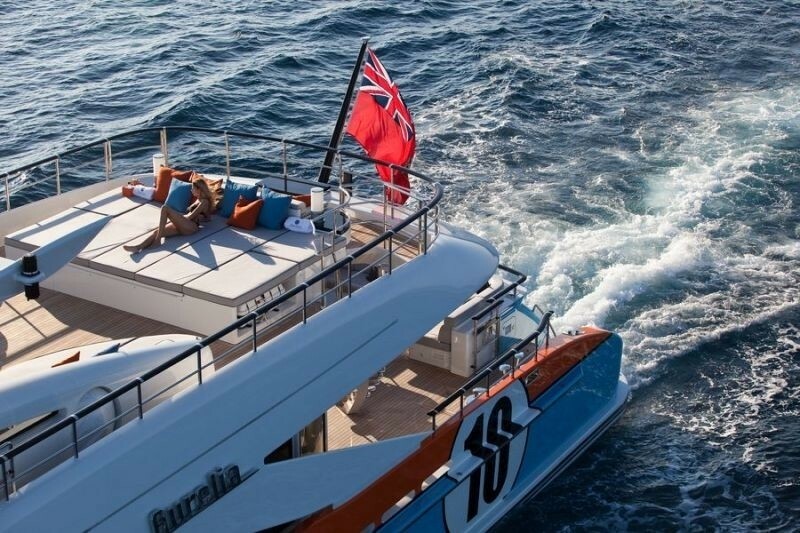 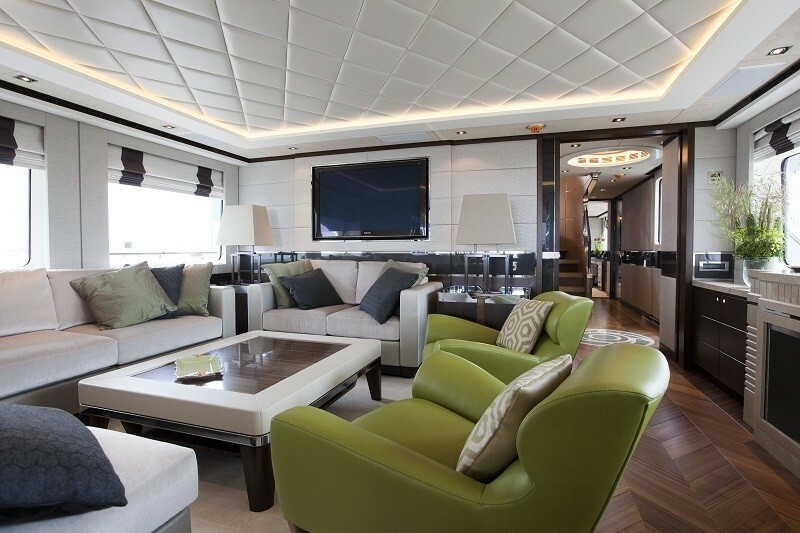 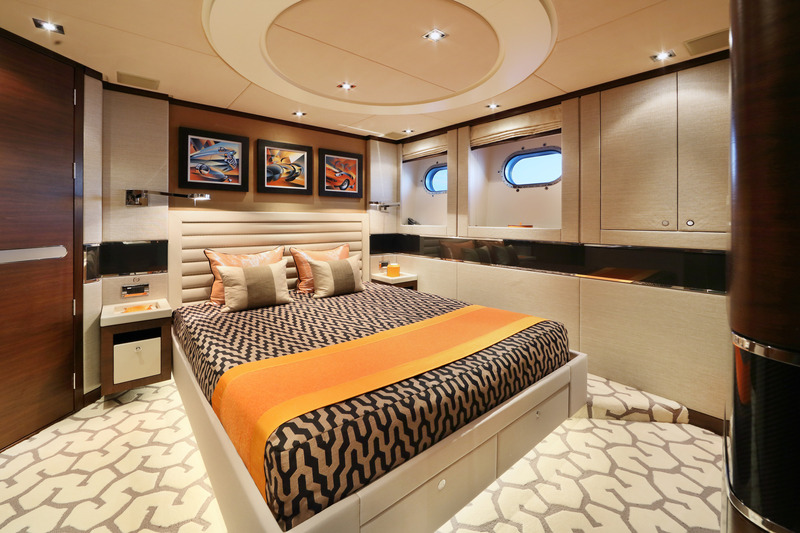 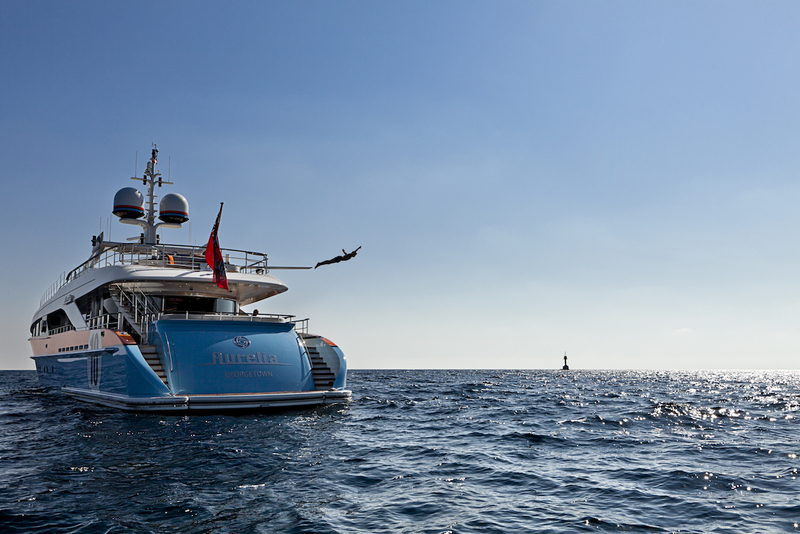 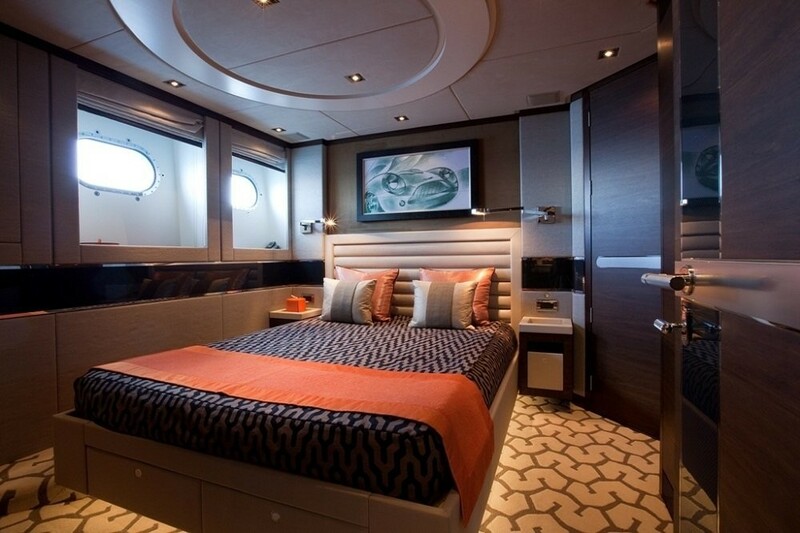 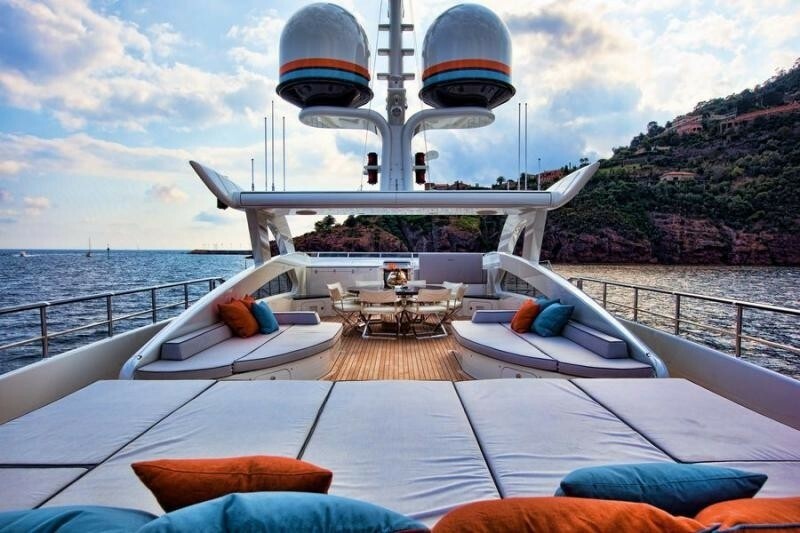 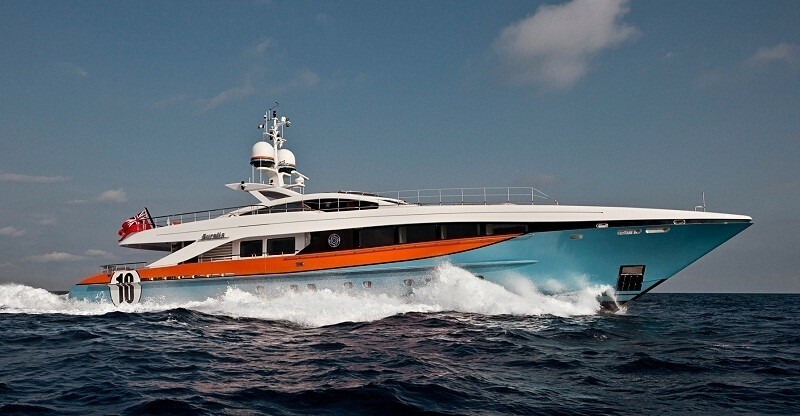 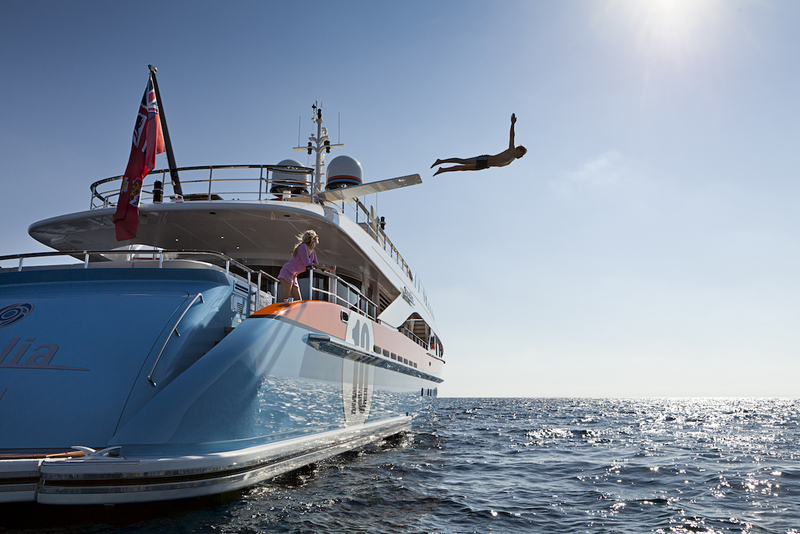 Motor Yacht Aurelia's unique paint scheme inspiration comes from the Gulf Racing colours, with a number 10 on her quarters. 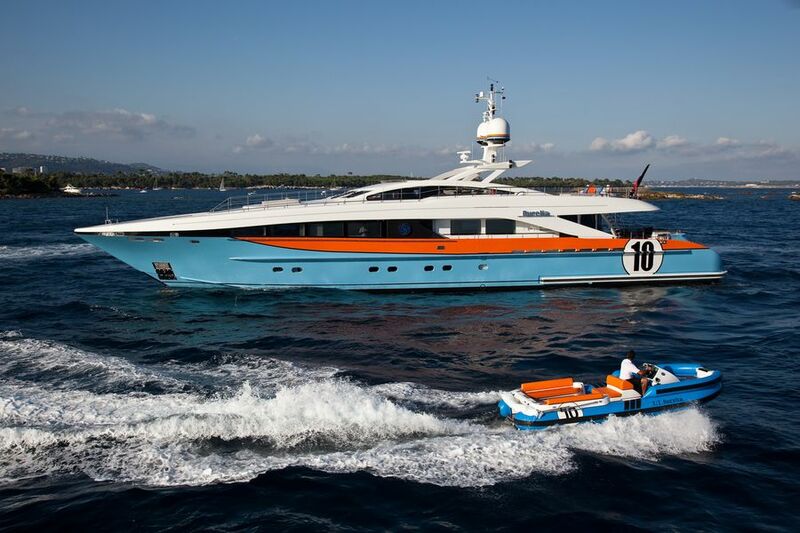 Dobroserdov Design, responsible for the paint scheme, repeated this detail on the 14 foot Castoldi tender to celebrate the yacht Owner’s true passion for sport and racing cars. 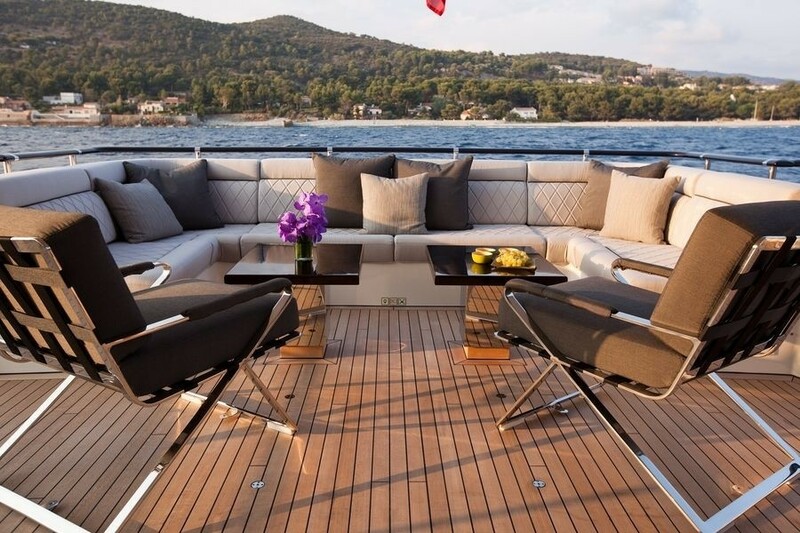 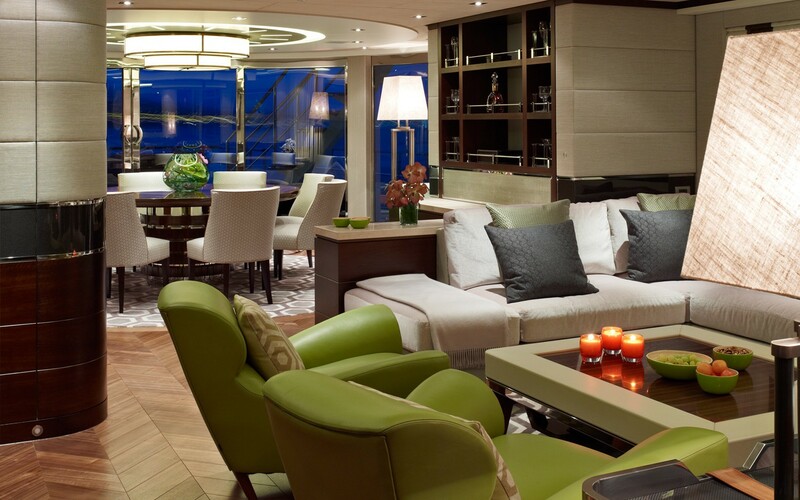 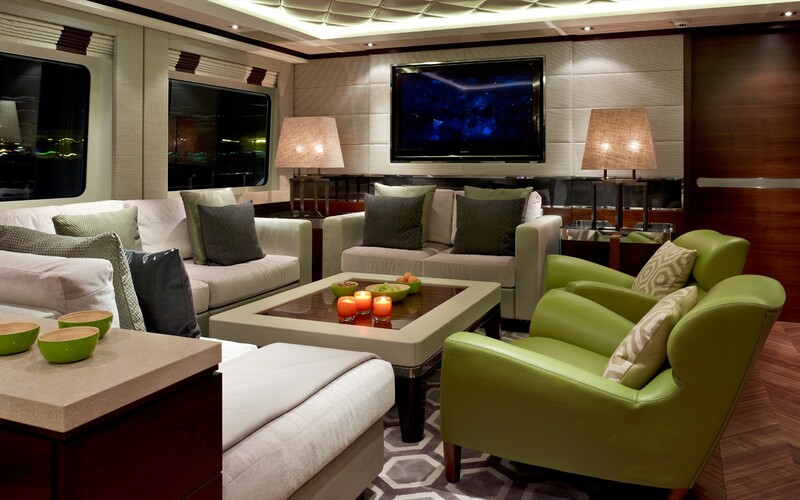 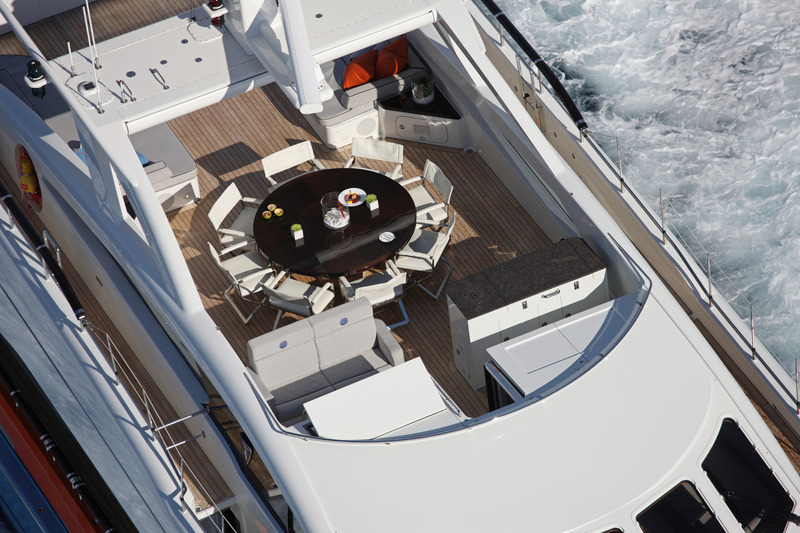 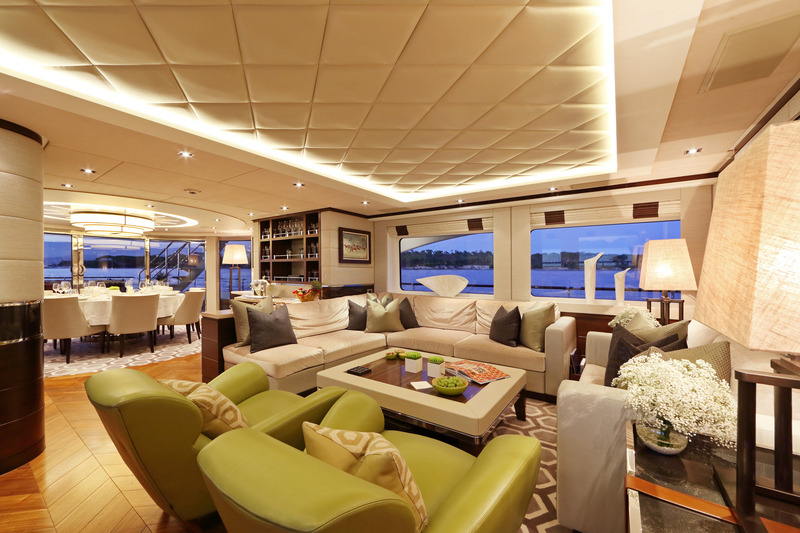 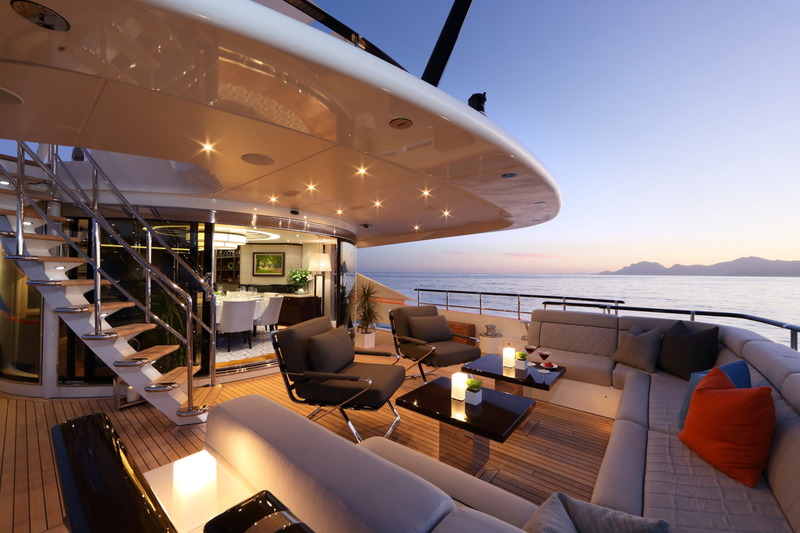 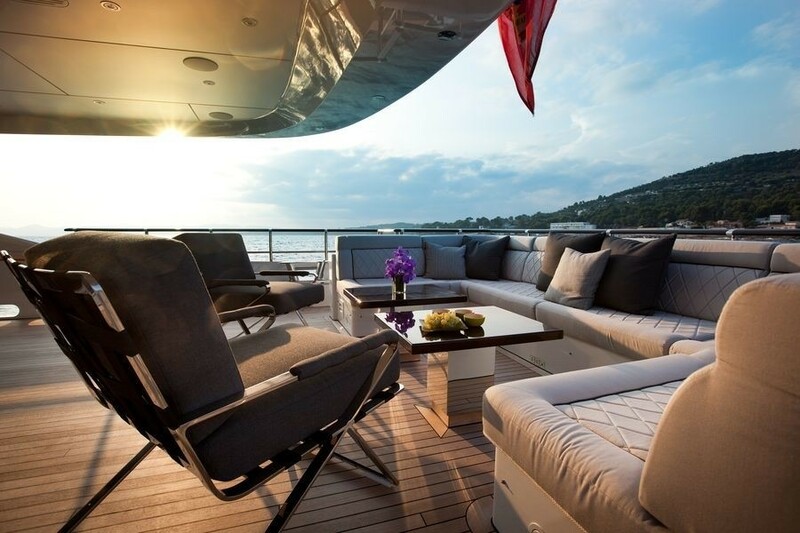 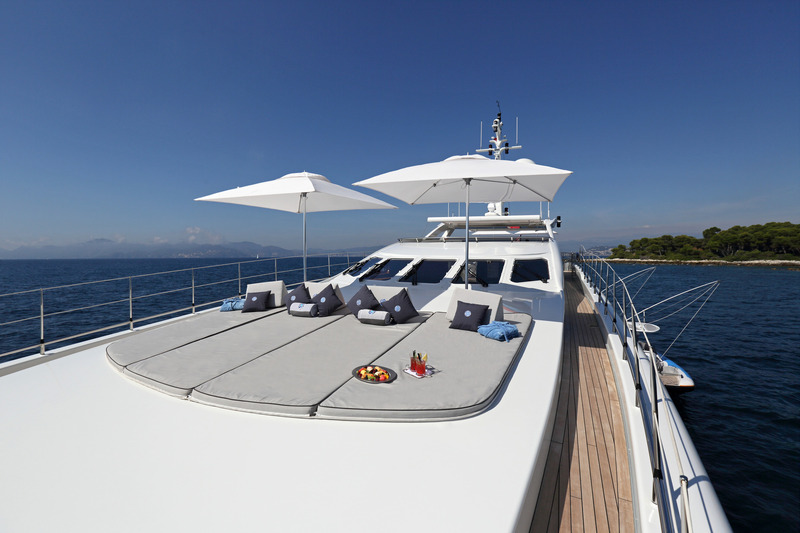 Outdoor areas of the M/Y Aurelia where guest can enjoy a time to relax include the partially sheltered aft cockpit, the large sundeck with its comfortable seating and convivial bar. 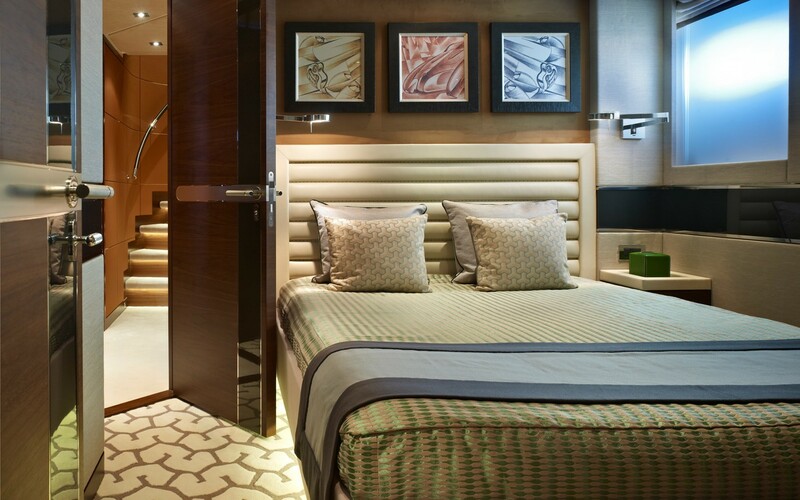 Large mattresses can also be found in front of the wheel house, perfect for sunbathing, reading or just simply unwinding. 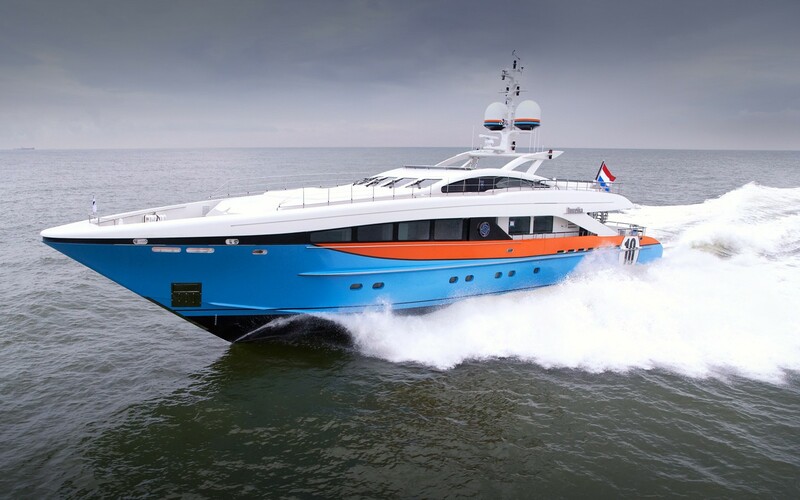 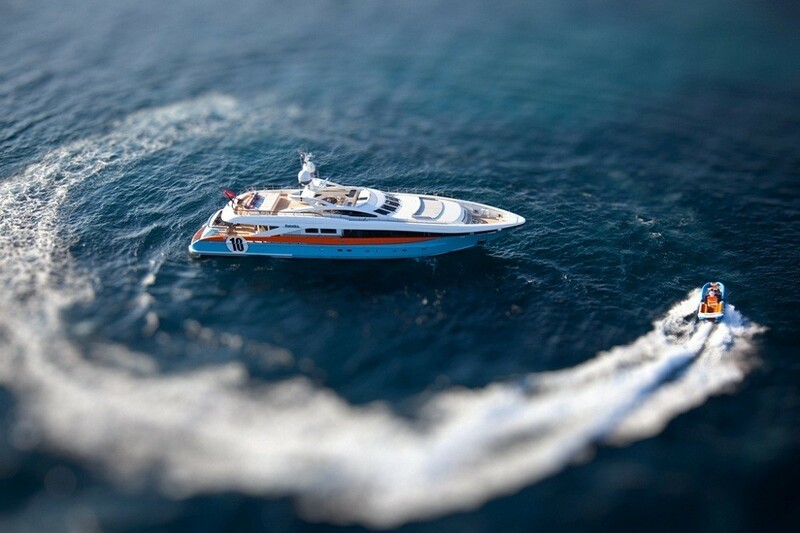 Heesen yacht Aurelia is powered by two MTU 16V 4000 M90 diesel engines able to reach a maximum speed of 30 knots. 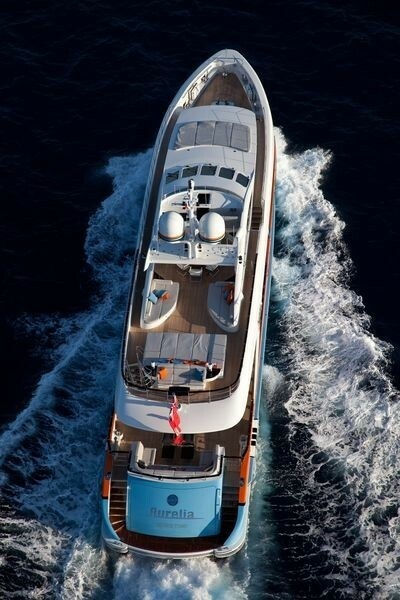 Her range at 12 knots is 1,900 nautical miles. 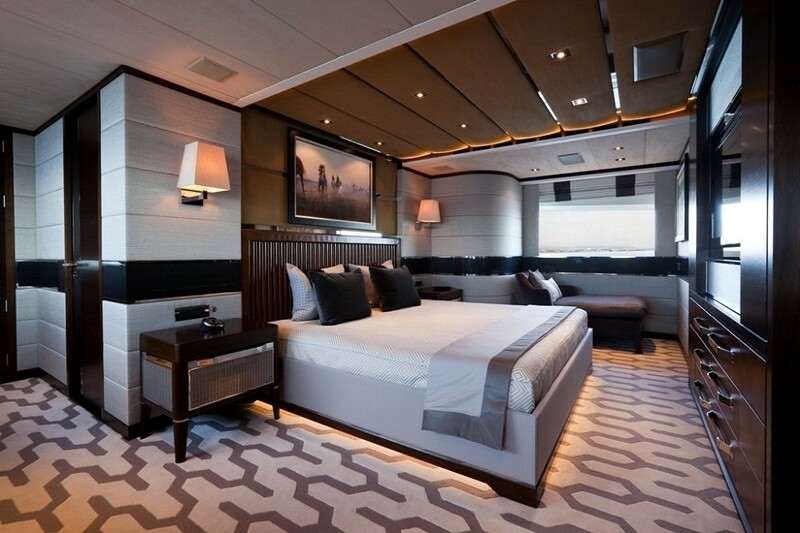 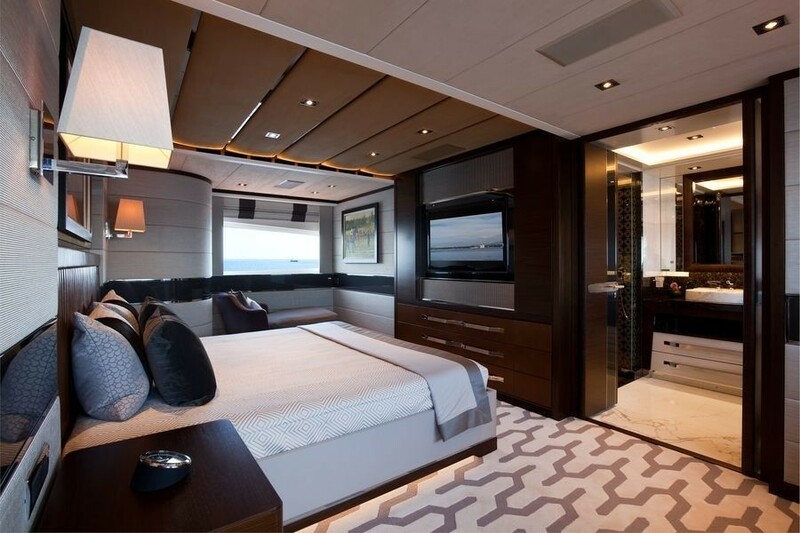 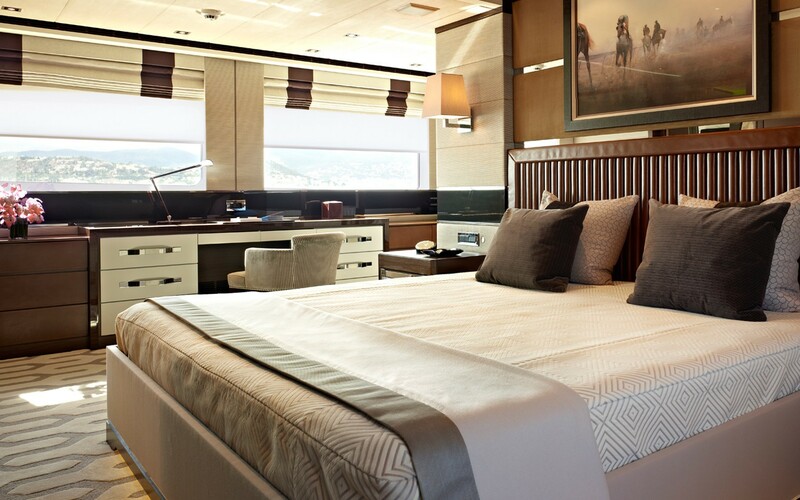 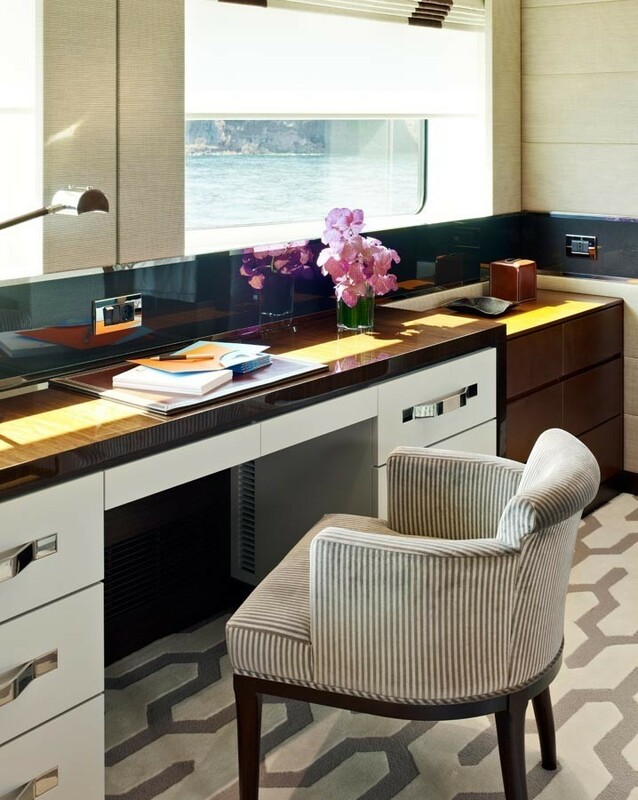 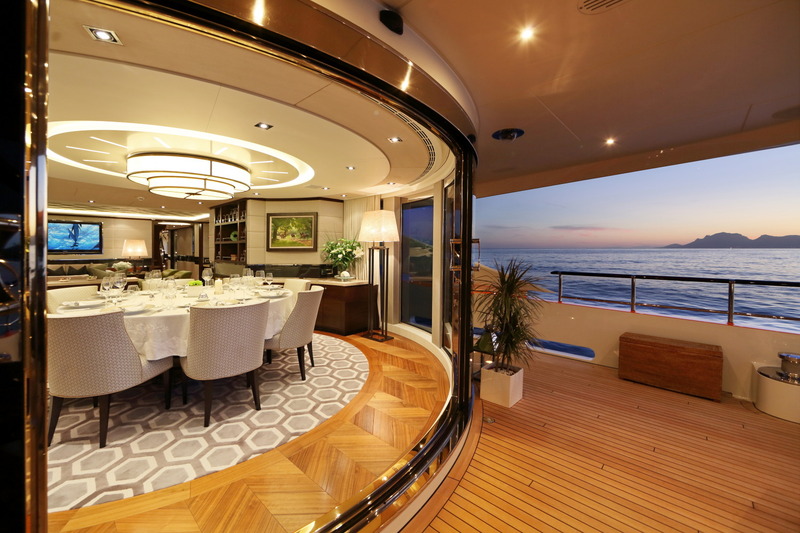 Accommodation is provided in four comfortable and spacious cabins, designed by Bannenberg & Rowell who took inspiration from race car designers: Bertone (Lamborghini), Pininfarina (Ferrari) and Agato(Aston Martin). 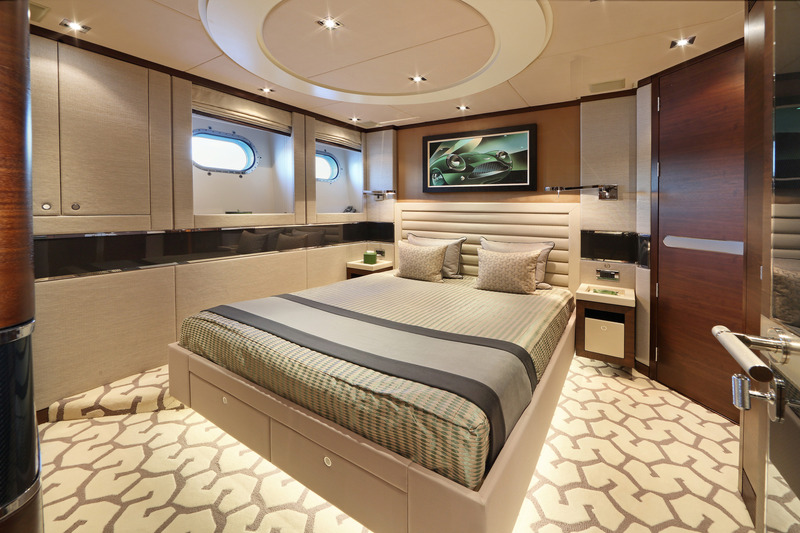 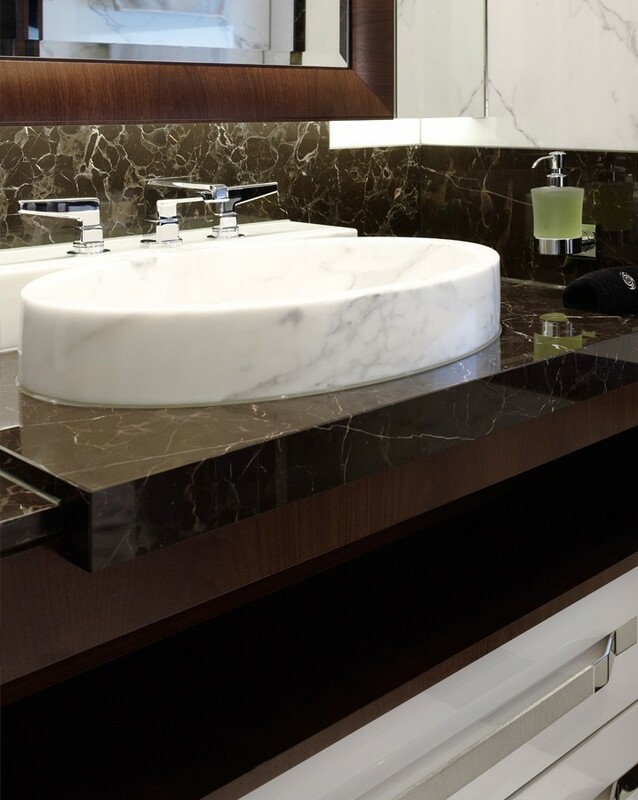 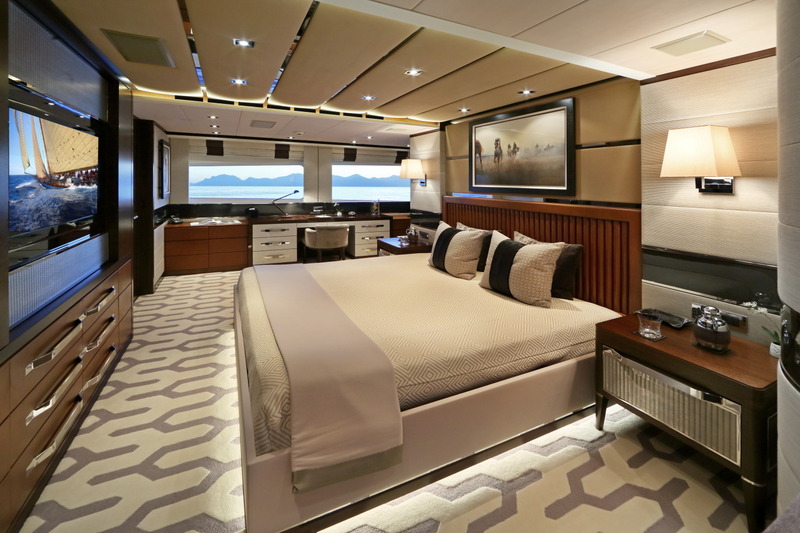 The full beam master suite is situated forward on the main deck, the large en-suite bath and a shower room has heated flooring. 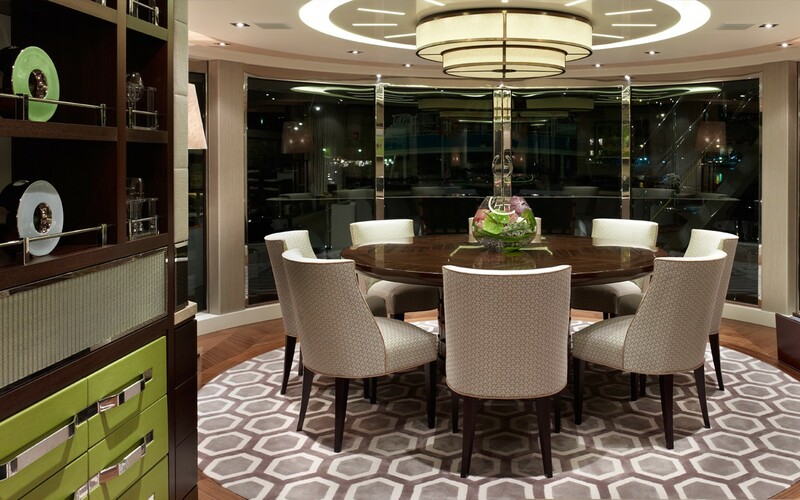 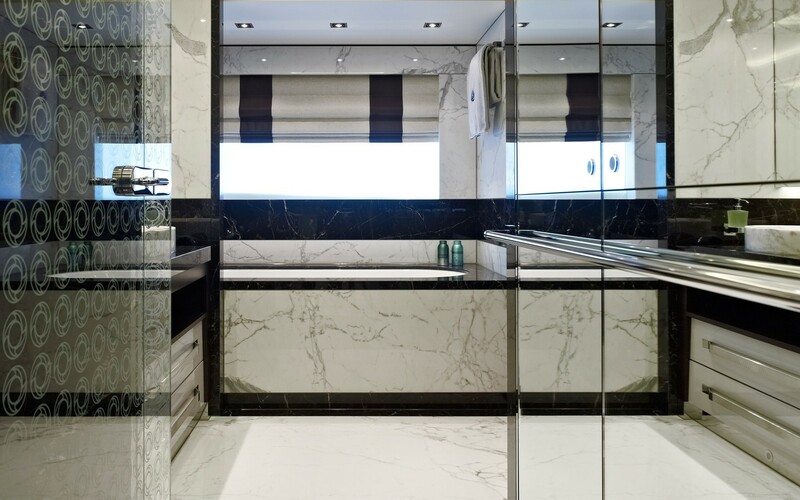 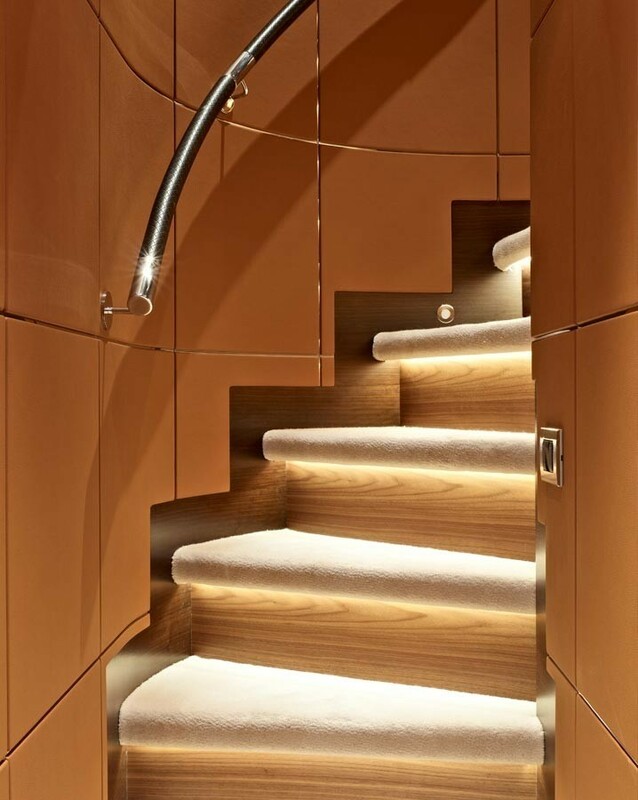 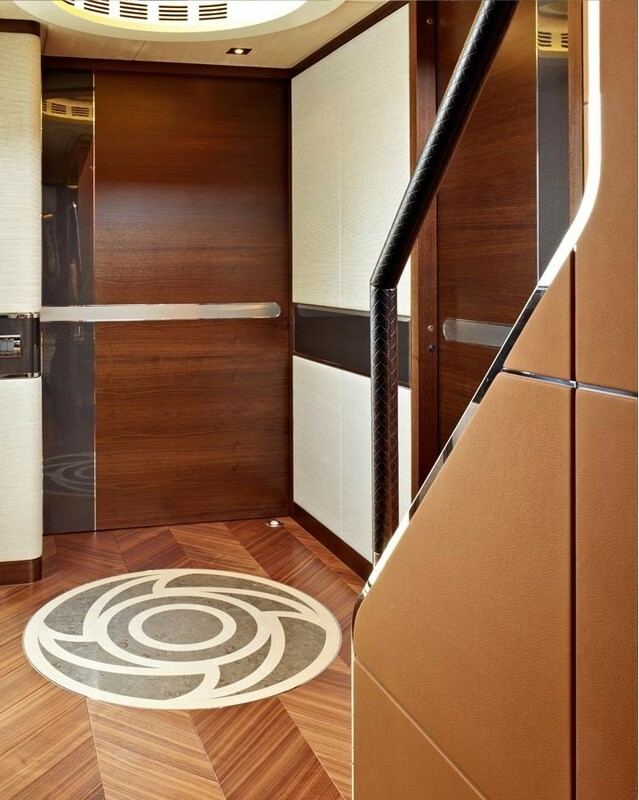 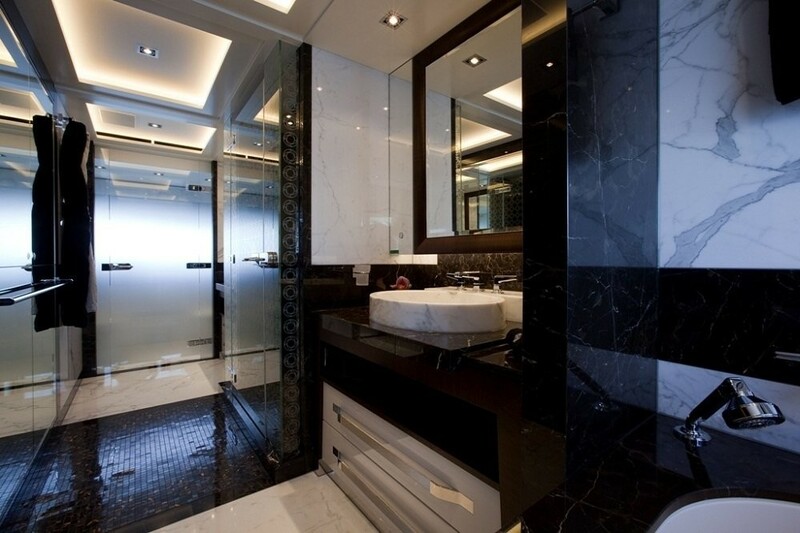 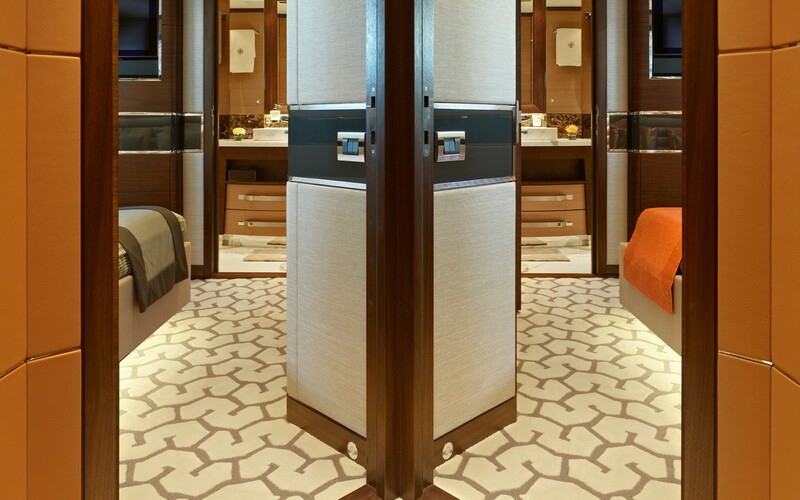 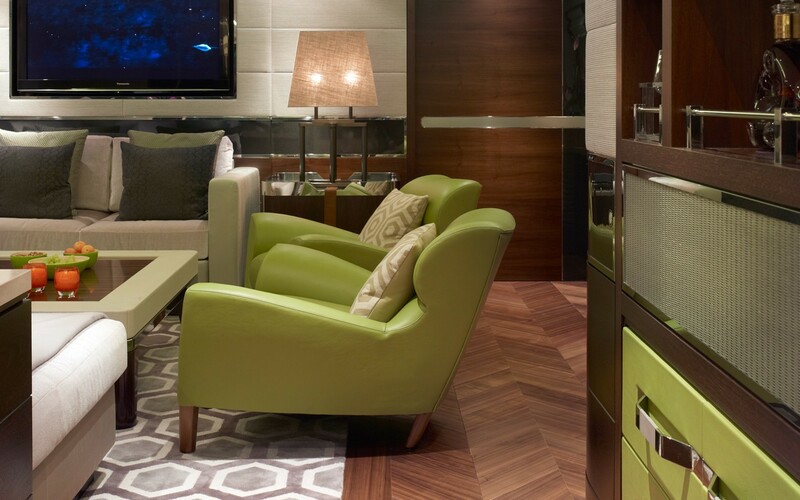 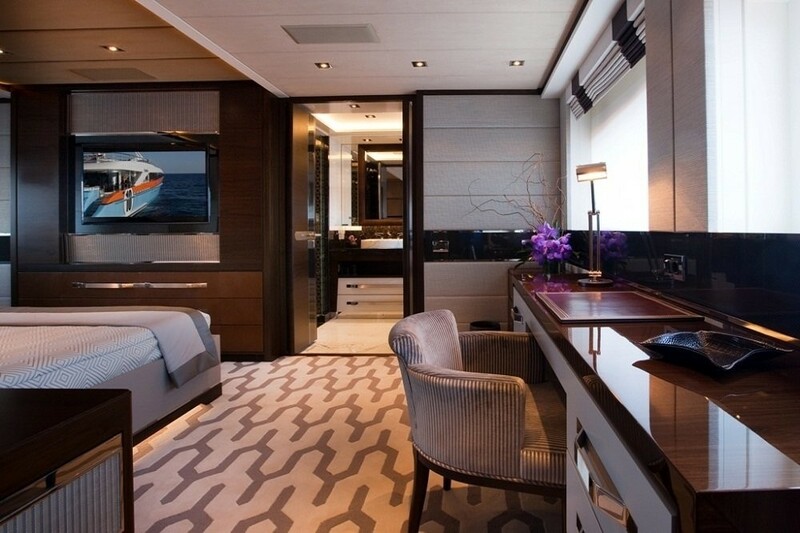 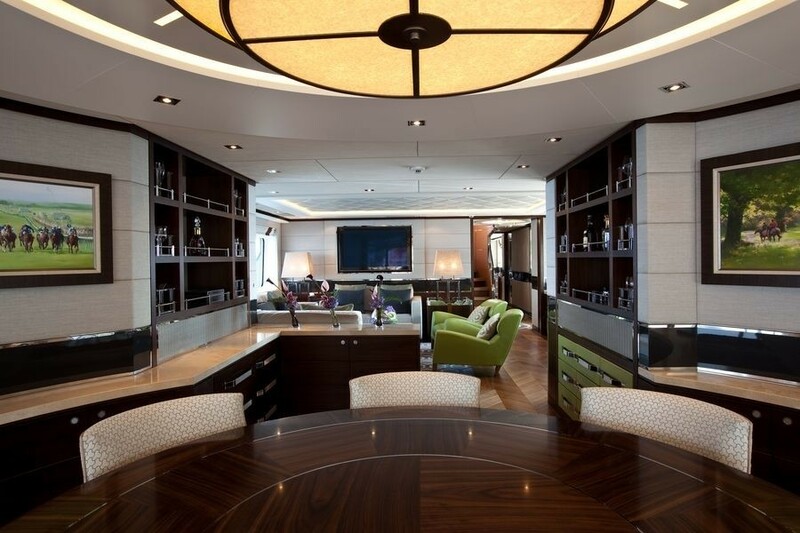 There is a large walk in wardrobe, mini bar/fridge, Kaleidescape movie system and I pod dock. 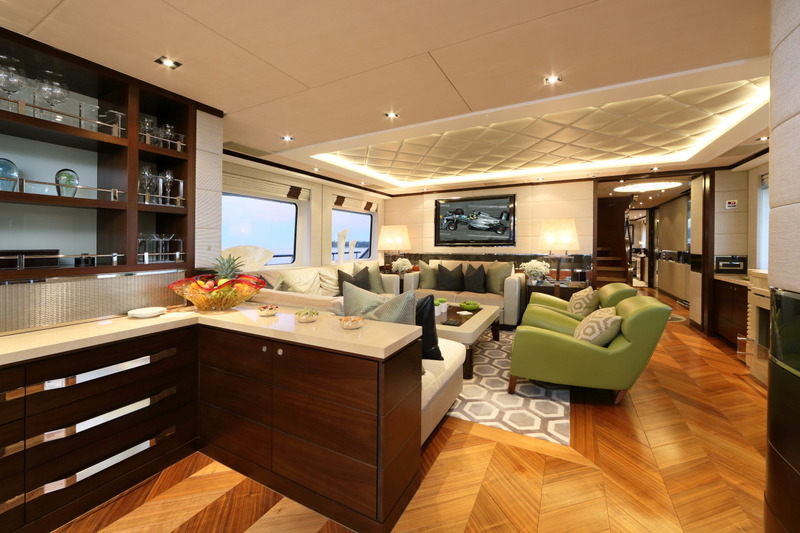 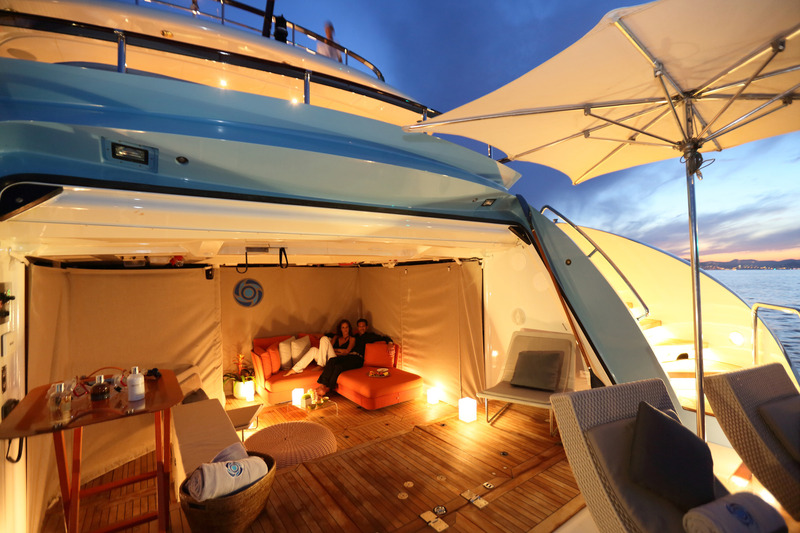 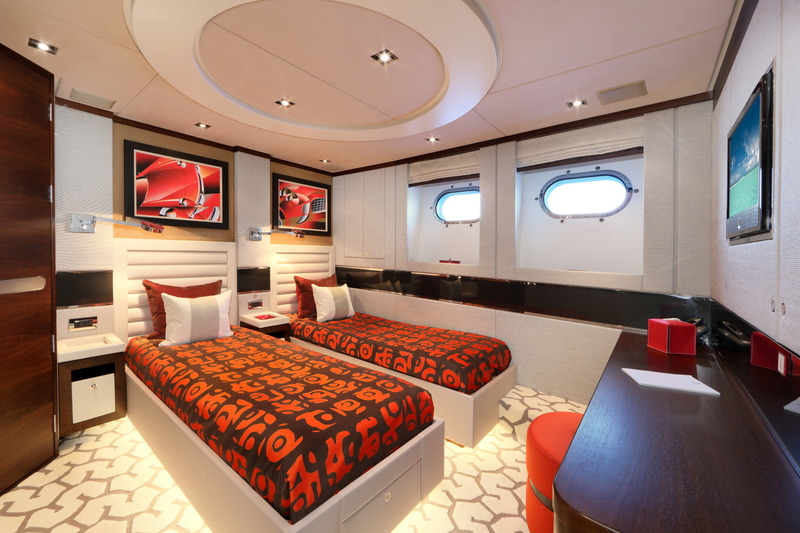 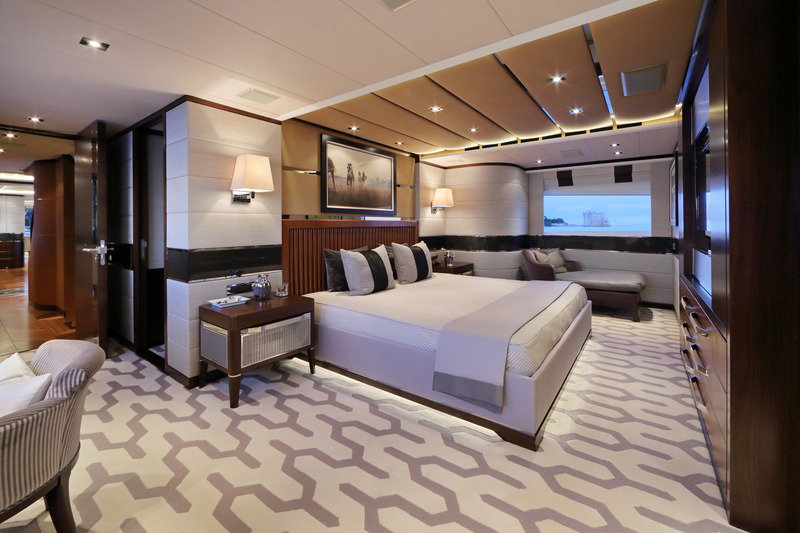 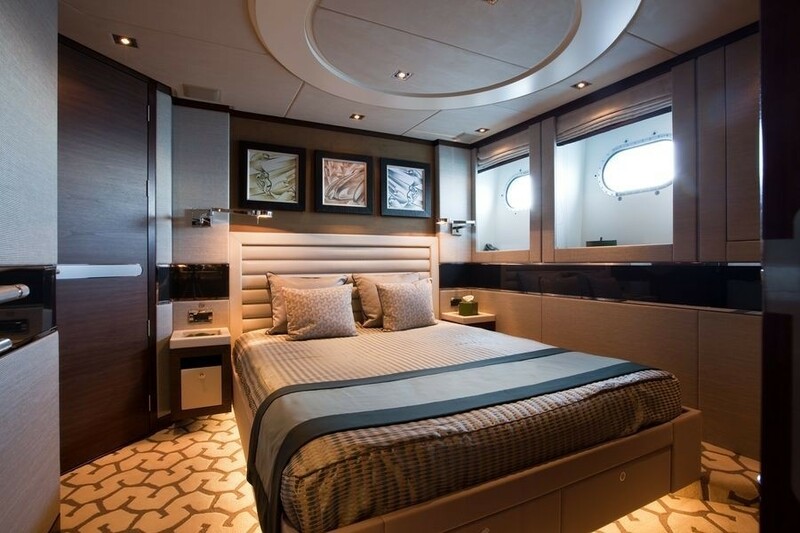 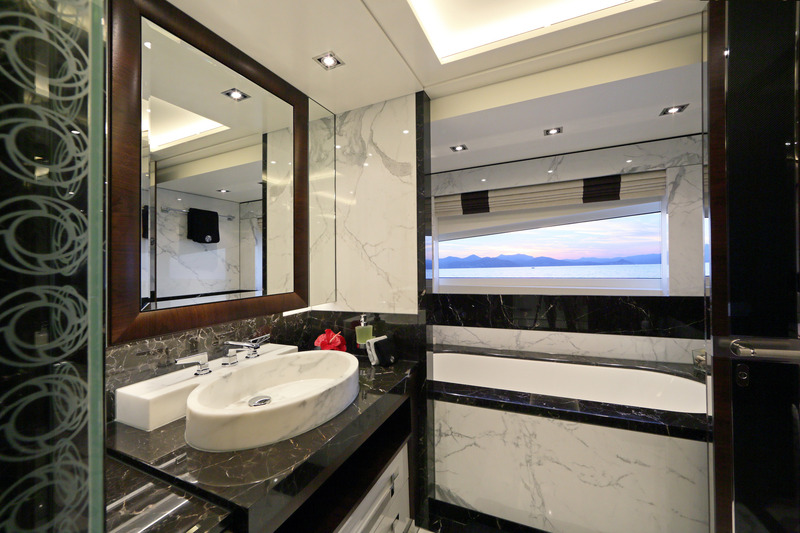 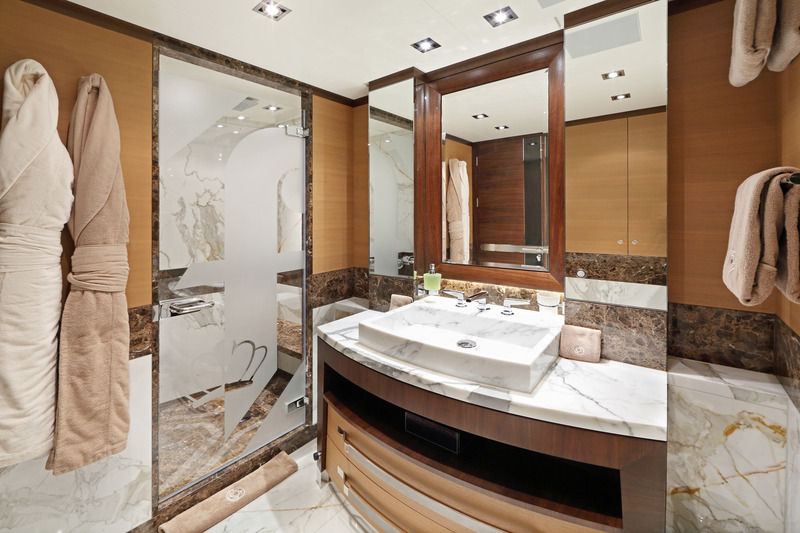 Below deck are two double guest cabins and one twin cabin, all with large en-suite shower rooms, Kaleidescape movie system and I pod dock. 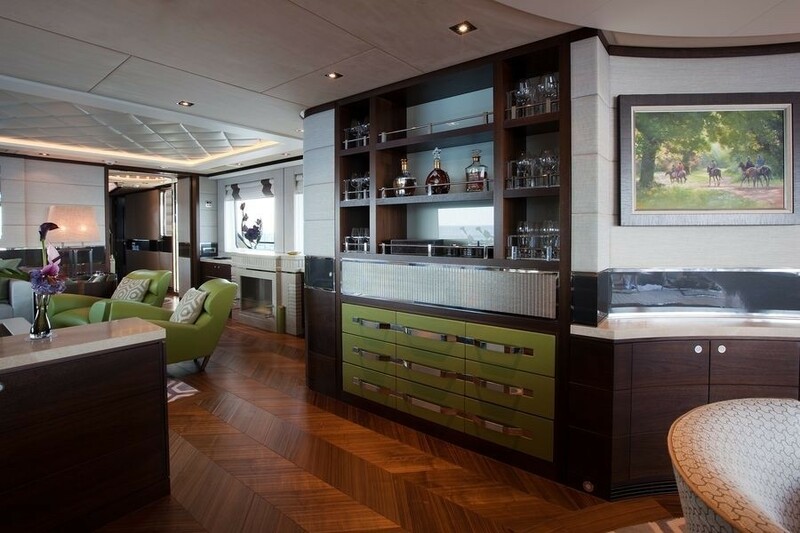 A mini bar/fridge is situated in the lower guest lobby.